Continued from Teenage Mutant Ninja Turtles #4. Leonardo, better prepared this time, battles the she-creature until she flees. Unexpectedly, the gigantic snapper busts through a wall and knocks Leo to the ground. Raph, Mike and Casey are visiting the sewer in search of the missing Leonardo. The guys hear something rumbling and head off to investigate. Leo is once again fleeing from the huge turtle. The monster is destroying tunnels as it crashes through them, and breaks some gas lines that create an explosion which sends Leonardo falling deeper into the sewers. The ninja lands in a gigantic pile of garbage, where he finds a huge egg. Leo picks up the egg and notes that he’s found some sort of nest in this garbage heap, just as the she-creature arrives. Rather than fight again, Leo threatens to destroy the egg, which shocks the fish woman and halts her advance. Leonardo motions as if he’s going to break the egg while his companions arrive. Mikey yells that there’s no need to kill anything, but the roof collapses under the weight of the giant snapping turtle above. The huge reptile falls from a great height and crashes into the garbage pile below. Leonardo escapes, but the fish-creature is buried beneath the snapper, along with her egg. The killer robot arrives in New York City. 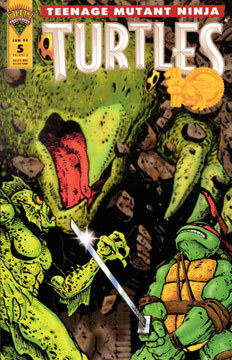 Continued in Teenage Mutant Ninja Turtles #6.